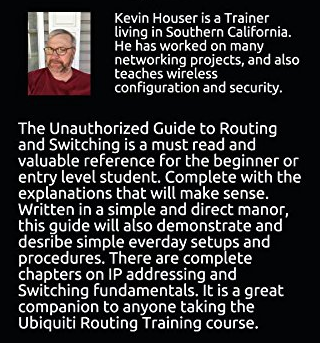 The Unauthorized Guide to Ubiquiti Routing And Switching is a must have for the entry level routing student who may be new to Ubiquiti routers and switches. *** NOTE: As of 4/1/2019, this product is no longer available via CrosstalkSolutions.com. If you would like to purchase this book, click HERE (or the yellow banner below) for the Kindle or Paperback versions from Amazon. 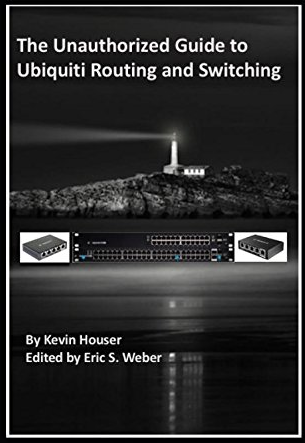 The Unauthorized Guide to Ubiquiti Routing And Switching is a must have for the entry level routing student who may be new to Ubiquiti routers and switches. A detailed look at both the theoretical overview and the actual working commands, with detailed step by step instructions on setting up both switches and routers. Configuration walk through for VLANs and setting up static and dynamic routing. Targeted for the beginner, this book will help you with basic configurations, and will offer lots of advice along the way. Written by Kevin Houser – a Ubiquiti trainer living in Southern California. Kevin has worked on many networking projects and teaches wireless configurations and security in addition to routing and switching.